2 Bedroom Terraced House For Sale in Yateley for Guide Price £299,950. 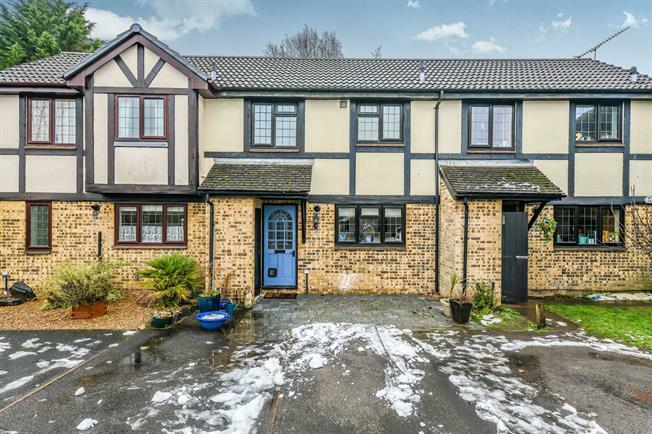 Offered to the market is this exquisite example of a "Mock Tudor" two bedroom terraced home with driveway. Situated in a quiet and highly regarded close, the property is perfectly placed for ease of access to local schools, shops , doctors surgery and amenities. Built in the early 80's the property has benefited from a complete refurbishment by the current owner with no expense spared and the finest quality materials used. Solid oak flooring runs through out the downstairs, with ceilings re-plastered, electrics rewired and a new boiler. The ground floor comprises an entrance hall, a high specification kitchen, with bespoke vintage style cupboards, granite work surface, integrated appliances; Five burner gas hob, "Neff" double over and extractor hood, dish washer, washing machine and butler sink. The living room is a good size and leads neatly into an open plan conservatory, completely altering the dynamic of the space above and beyond what is typical of the property style. Upstairs there are two bedrooms, and a superb four piece family bathroom suite, with floor to ceiling tiles, a "betty boo bath tub" and separate shower unit. Externally there is an appropriate size private rear garden boasting a delightful patio area and well kept lawn. To the front the is a driveway and parking for several vehicles.